Newly hatched chicks using the Surehatch incubator. Fintrac. 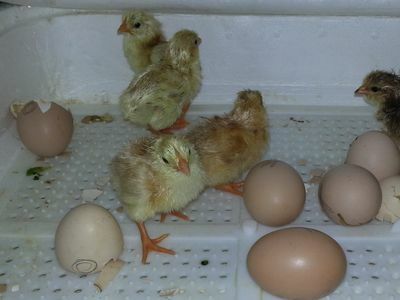 Surehatch, a South African company, is improving the productivity of the sub-Saharan poultry sector by selling small-scale egg incubators that provide ideal conditions for an egg to develop and hatch. Using these incubators, poultry farmers can increase chick production by up to 10 times compared to traditional production. Surehatch also provides customers with training in proper use of the incubators. Owing to its success in the South African market and expressed interest from other countries, the company began exploring sales opportunities in Kenya. In 2014, after two years of market research, Surehatch modified its incubator design and sold 20 units within two months of its introduction into the Kenyan market. Also seeing the potential benefits to smallholders, USAID’s Feed the Future Partnering for Innovation program committed support to accelerate market entry through 2015. This included expanding the stock of incubators to include sizes that were more affordable to smallholder farmers. By early 2015, Surehatch had steadily increased sales. Customers using even the smallest incubator increased their monthly income by more than 50 percent, and business growth seemed on track. However, in mid-2015, customs agents stopped a container shipment of incubators from the South African production facility. Surehatch was expecting 100 units manufactured in Cape Town to arrive in Mombasa using the same shipping process it had used since 2014. Unbeknown to Surehatch, the Kenya Bureau of Standards (KEBS) had changed its customs policies to require both an inspection and a certificate of conformity for all products entering Kenya. Though the company had a certificate of conformity for the shipment, its container was detained and, ultimately, the entire shipment was lost. For nearly six months, Surehatch tried to work with KEBS to provide further documentation to release its shipment, as well as clarify the requirements for any future shipments. Eventually, KEBS finalized its import procedures and selected an internationally recognized company to conduct pre-inspections. At the end of 2016, Surehatch began working with the inspector in South Africa to obtain certification for the shipment prior to export. The business hired a third-party customs clearance agent to facilitate import into Kenya. The sudden change in import policies temporarily shut down its operations in Kenya, slowed down market penetration (and with it, the ability of smallholder farmers to access a technology that improves their progress out of poverty), and increased costs. In 2017, Surehatch began to adjust its business model to account for the higher costs, including securing a partner that could provide financing to Surehatch customers. Surehatch also partnered with other companies to bundle the incubators with other agriculture products. For companies like Surehatch to risk selling products and services to smallholder farmers — which in this case required product re-development to meet a lower price point — the transaction costs for trans-border commerce shouldn’t drive up the cost of introducing new agriculture technology. Programs like Feed the Future Partnering for Innovation can help offset costs as companies get up and running, and complementary policy support is integral to this process. Surehatch lost months of sales due to unforeseen changes in customs rules. In many cases this can be enough to prevent market entry or expansion, which is unfortunately an all too common story in Africa and other emerging economies. For example, partners in Zambia, Malawi and Guatemala entering into inputs markets have experienced long customs delays, particularly for equipment imports. Such delays stunt smallholder farmer access to the products they need to build their farming enterprises into successful commercial operations and thus hinder our overall progress toward food security and improved livelihoods. Learn how a pilot shipment of watermelons has the potential to change Ukraine's agriculture market system.